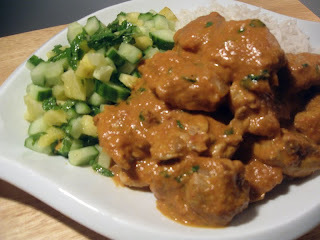 Butter chicken has to be the most famous Indian dishes outside of India. But from what I've heard it's not actually called Butter Chicken there... or at least parts of India, but either way it's a yummy dish and I don't care. Butter Chicken is probably best with boneless skinless chicken thighs, but you could also use chicken breast if you want to be healthier. 1. Mix yogurt with cayenne, cumin, salt, pepper. Cover this yogurt mixture on to the chicken thighs. Then bake chicken thighs in the oven at 400 degrees for 15-20 minutes. 2. Chop up onions, and sautee them in a frying pan until they start to get caramelized. Then toss in your cayenne, cumin, curry powder, coriander into the onions and cook for a few minutes to reinvigorate your spices. Toss in some tomato paste, or canned tomatoes, and cook down until tomatoes seem cook. Transfer mixture to a food processor, or blender, or use a hand blender, and blend til smooth. 3. Mix in some cream and butter until the mixture to help make it creamy and velvety. Then put in your cooked chicken thighs and let them cook out a little more in the sauce. 4. Serve butter chicken over rice. And a great salad to accompany it would be some chopped pineapple, cucumber and mint. Dress is with a little vinaigrette or keep it plain.